Themed volume: Jewish Studies and the New Testament. Download the complete volume for free (1.4 MB, pdf). Buy the printed edition ISBN 978-1-4632-0422-8. The Jewish Annotated New Testament, published by Oxford University in 2011, had little precedent: this was the first time that a group of Jewish scholars wrote a commentary (with supplemental essays) on the entire New Testament. As its editors, we were attentive to how the book would be perceived by a readership that, for various reasons, might find the volume at best odd, at worst scandalous. We conceived of and edited the volume with three main audiences in mind: Christians who wanted to know more about the Jewish background of the New Testament; Jews who had little familiarity with the New Testament; and readers from any background who were curious about the New Testament in its original historical matrix. In this essay we discuss our goals in writing the commentary for these audiences, such as overturning Christian stereotypes of Jews and Judaism and Jewish stereotypes of Christians and Christianity, and showing Jewish and Christian readers a part of their intertwined history. We also discuss the book’s reception, which has been largely positive in Jewish and Christian communities and classrooms, despite acerbic and even frightening reviews and blog posts by a handful of readers. It is commonplace in New Testament studies to point out that ancient writings need to be understood within their contemporary context if a historical reading is what we aim for. Most often, however, the framework within which to understand a text’s thought patterns is sought in the world of ideas that can be found in other literary texts roughly contemporaneous with the text under investigation. It is far less common for scholars to provide a detailed analysis of the institutions of ancient societies in which the transmission of oral traditions and the production of texts were embedded, and allow this socio-institutional setting to interpret the thought patterns of a text. In this study, key ritual-theological themes in Matthew’s narrative world are linked to, and understood from within, first-century synagogue institutions. As a result, Matthew’s theology of purity, forgiveness, and atonement emerge as thoroughly intertwined with a first-century Jewish worldview rather foreign to later forms of mainstream Christianity. Perhaps one of the most significant developments within contemporary Jewish Studies is the reclamation of the New Testament. The recovery of this particular part of Jewish history, however, has highlighted the problem of anti-Semitism that has for so long been associated with these documents. Although there is nothing as brazen as the Matthean ‘blood cry’ (Mt. 27:25), or the Johannine denouncement of ‘the Jews’ (e.g. Jn. 8:44), Hebrews is often placed among the most anti-Jewish texts of the New Testament. Key themes contributing to this perception are mainly found in the central section which paints Jesus as the eternal high priest, who offers the definitive means of atonement, and inaugurates the superior new covenant. On the other hand, it is often noted that this ‘radical supersessionism’, as it has been called, must be qualified by the author’s own Jewish identity and context, making charges of anti-Judaism, or even anti-Semitism, somewhat misleading, not to mention anachronistic. This paper revisits the anti-Jewish character of Hebrews in the light of recent developments in Jewish and New Testament Studies, showing how the classifications of this text as ‘anti-Jewish’ are not as straightforward as many have supposed. This article focuses upon Josephus’ portrayal of the Pharisees during the reign of Queen Alexandra, relating it to their depiction in other contemporary sources (the New Testament, Qumran documents) as well as rabbinic literature. The numerous hostile descriptions of the Pharisees in both War and Antiquities are examined based upon a philological, textual and source-critical analysis. Explanations are then offered for the puzzling negative description of the Pharisees in rabbinic literature (bSotah 22b), who are considered the predecessors of the sages. The hypocrisy charge against the Pharisees in Matthew 23 is analyzed from a religious-political perspective and allegorical references to the Pharisees as “Seekers of Smooth Things” in Pesher Nahum are also connected to the hypocrisy motif. This investigation leads to the conclusion that an anti-Pharisee bias is not unique to the New Testament but is also found in Jewish sources from the Second Temple period. It most probably reflects the rivalry among the various competing religious/political groups and their struggle for dominance. The first extant translation of the four Gospels into Hebrew is to be found in a late fifteenth-century manuscript kept in the Vatican Library (Vat. ebr. 100). The study of this manuscript has to date been rather haphazard and very little has been written about it. Delcor argued in 1981 that it was probably translated from Catalan and suggested that the translator was a Jew, probably writing at the end of the fifteenth-century or the start of the sixteenth-century. In this article we attempt to demonstrate that the manuscript is a copy of the original fourteenth or fifteenth century translation. It was indeed based on a Catalan translation of the Gospels, specifically, the so-called ‘Bíblia del segle XIV’, which is to be published in the Corpus Biblicum Catalanicum. There are small but significant hints that the translator was a Jew writing for a Jewish audience, in order to provide them with knowledge of these core Christian texts (possibly to help them to undermine Christian polemicists). However, the possibility also exists that this translation was carried out by a converso for others who, in the aftermath of 1391 and the Tortosa disputation, had converted or were considering conversion, in order to inform them about their new faith. 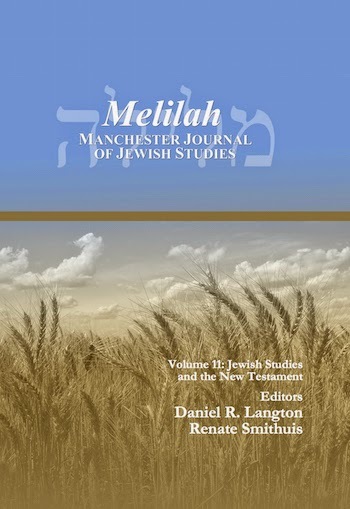 Daniel R. Langton, Some Comments on Micah Berdichevsky's Saul and Paul (Melilah 2008 vol. 5). Bernard S. Jackson, Why the name New TESTAMENT? (Melilah 2012 vol. 9).